I returned on Sunday from a week of ski touring with Conrad Janzen out of Mt. Carlyle Lodge in the southern Selkirks. The snowpack at Carlyle, like most areas in western Canada this winter, is a lot thinner than usual, around 220 cm vs the usual 350+ cm at treeline. We arrived to find a recent storm had deposited about 20 cm with little wind on a heavily facetted upper snowpack. Temperatures were cold all week, with lows in the -20s and highs in the mid negative teens, and upper snowpack facetting continued. These conditions made for excellent ski quality all week, especially on W - N - E aspects. We were concerned about two main avalanche problems. The first was the persistent weak layers down 50+ cms seen elsewhere in the Selkirks. These were unreactive throughout the week. Nevertheless, we treated steep due south aspects with respect, in spite of the appeal of untouched sunny powder skiing. Test profiles showed easy to moderate results on a persistent weak layer (facets/suncrusts) down about 50 cm -- failure while isolating a column (before tapping) with sudden planar characteristics was one impressive example. 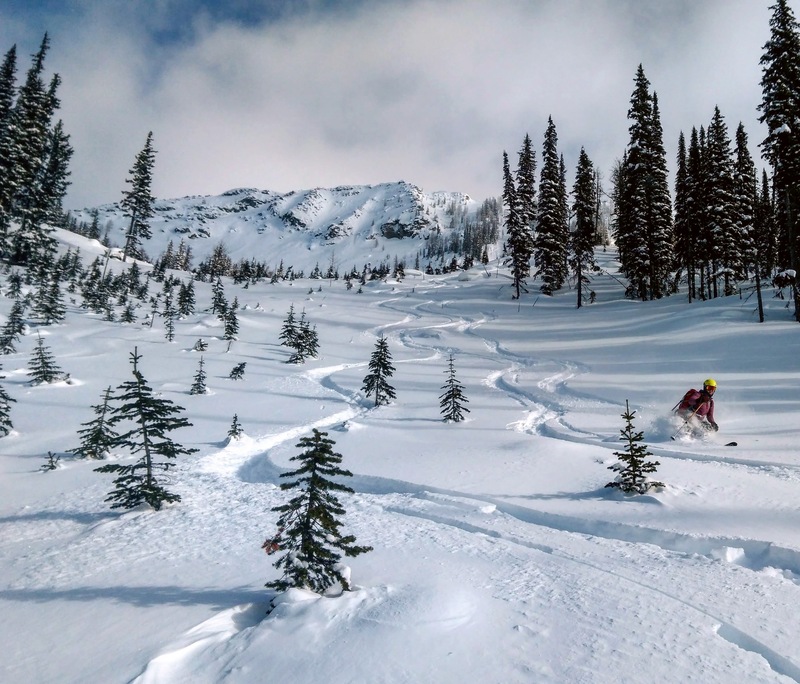 Our concerns were confirmed with a skier accidental avalanche size 2.5 in the not too distant Whitewater slackcountry early in the week. W - N - E aspects on the other hand seemed stable due to the facetted upper snowpack and we skied steep lines at all elevations on these aspects with no reactivity whatsoever on the underlying persistent weak layers. The second problem was windslabs from E to NE winds. These were most reactive on steep southerly aspects, but variable winds meant thin windslabs in the alpine on all aspects to size 1.5. On Thursday and Friday a cold storm deposited about 35 cm of fresh snow in the alpine with some wind effect in the alpine that spiked avalanche hazard to considerable briefly but settled out by Saturday with a return to moderate avalanche hazard.